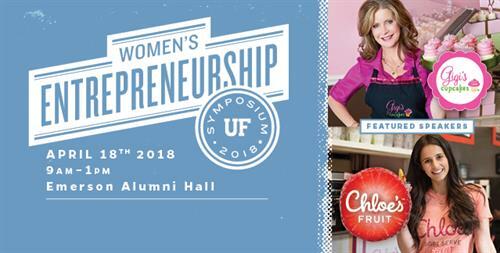 Mark your calendars for the 2018 Women's Entrepreneurship Symposium presented by Cox Business, the Entrepreneurship and Innovation Center and the Collaboratory for Women Innovators.This year's program will feature Gina "Gigi" Butler, founder of Gigi's Cupcakes, and Chloe Epstein, founder of Chloe's Fruit (a Gator100 company). Other successful guest women entrepreneurs will round out the program and will show you how entrepreneurial skills and approaches help in your career as well as in your venture. Tickets are free to UF Students; nominal fee for other attendees. WES is open to the public; visit our website to get your tickets: http://warrington.ufl.edu/wes.